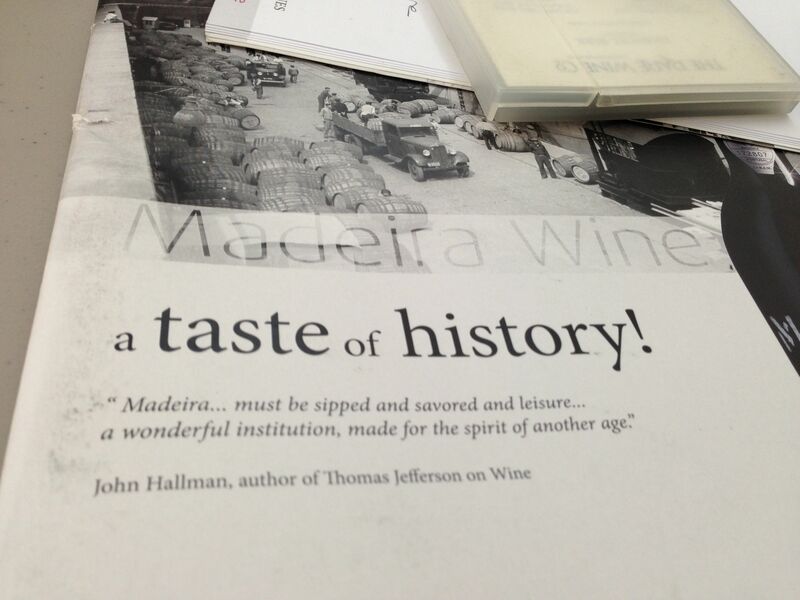 The press materials for Madeira start out with the line “Madeira is a gift of nature” I tend to agree with this assessment and I haven’t even been to that isle. Madeira has always fascinated me both for the wine and for the island which sits in the Atlantic, off the coast of Portugal. I’ve been hoping to visit and feel a trip coming on as my friend Eileen Le Monda remarked to me during class, “let’s get a ticket now.” We didn’t make it from the International Wine Center directly to JFK but I foresee that in the future. During today’s tasting at the International Wine Center, Bartholomew Broadbent, Mannie Berk, Julio Fernandes and Humberto Jardim from Broadbent, Rare Wine Co., Justinos and Henriques & Henriques, respectively treated 30+ former diploma students to a magnificent tasting of Madeira. It was great to see all my diploma friends and interesting how many of us are huge Madeira fans. 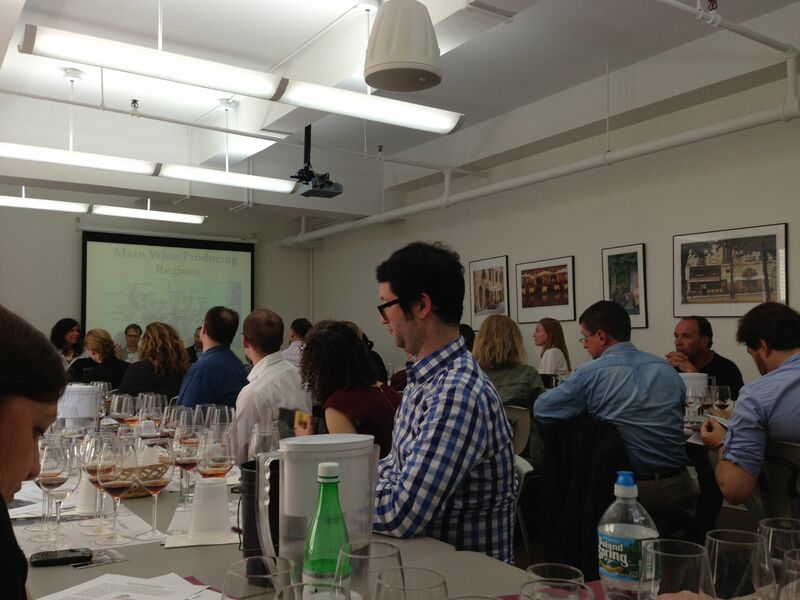 Today’s tasting was an informal event in which each of the participants described how they came to Madeira. 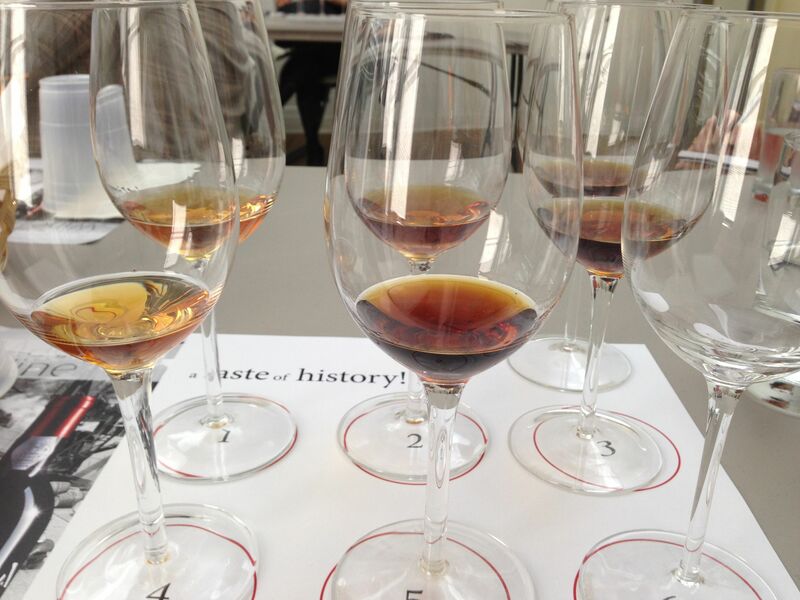 Broadbent is credited with renewed interest in Madeira thanks to a 1989 tasting he held in San Francisco. 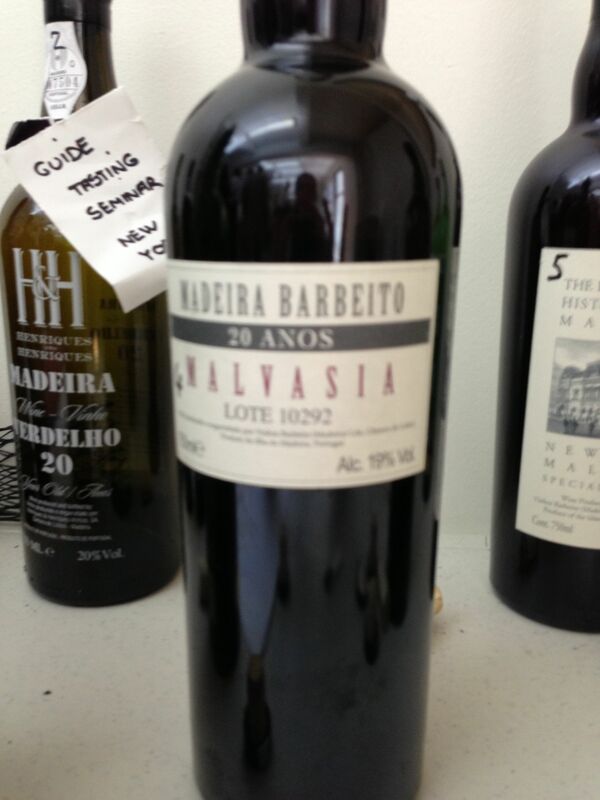 Apparently before the tasting, only one restaurant in the city had a Madeira on it’s list and the day after one restaurant put seven different Madeira’s on their menu. Broadbent said that between Prohibition which ended in 1933 and 1989, little Madeira was bought, sold or drunk on our shores. This was not always the case. Mannie Berk enlightened us with a shortened version of US history with Madeira, considered to be the drink of the well-heeled “robber-barons.” In fact, Berk considers the end of that era to be the death of JP Morgan who had been the largest collector of Madeira in US history. His son was more interested in the nascent cocktail culture and Madeira fell out of favor. To read more about Berk, check out this great article by Elin McCoy. Today there are about 1500 grape growers on the island, each with very small plots. There are only six firms that actually export the wines, although each firm represents more than one brand. The wines are made from four “noble” grape varieties – Sercial, Verdelho, Boal and Malmsey (Malvasia). After the tasting, I asked Berk and Broadbent how I might recognize the different varieties in a blind tasting. Both said it is very hard unless you go by color or sweetness but they did give me a couple of indications to go by. We spoke generally about the grapes being harvested, with vineyards varying from sea level to 600 meters above sea level. The wines are then fortified with alcohol from Spain. They are then heated for three months either with an internal coil or on the outside of the tank. The wine is aged in oak barrels that have generally been used to age something else as well be it scotch or port or both. 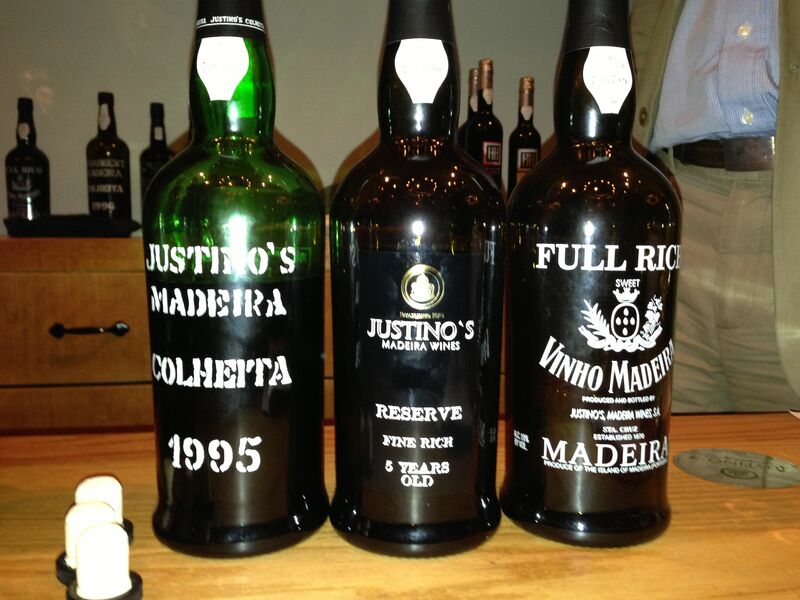 There is so much more to say about these wonderful wines but nothing can compare to tasting a Madeira. I would drink these with cheese, dessert or alone. I’d even like to see what else they might pair with in terms of entrees. Thanks to IVBAM for bringing us these wines and to Dunn Robbins Group for setting up the tastings at Corkbuzz and at the International Wine Center. It truly made my week. This amber colored beauty had a nose of dried fruit, nuts, and apricots. The searing acidity made this seem also dry on the palate. This amber-brown colored wine had aromas and flavors of brown sugar, nuts and cedar. It’s gorgeous minerality made me sit back and smile. I found this one to be sweet yet creamy which was unexpected with almost chocolate flavors and hints of oak. With this one, I felt that I was eating dessert. It was quasi chewy on the palate. This wine was light and golden in color with elegant citrus and floral notes. It also had searing acidity and wonderful minerality. This Madeira was darker in color and had a bigger, more powerful structure with somewhat of a medicinal note on the palate. Berk said that it has 85% Malmsey and 15% of Tinta Negra which was responsible for the robustness of the wine. This was such an incredible treat and was so savory on the palate after more than 100 years. An fabulous treat for anyone who has the opportunity to taste this historic wine.